Would you diet without weighing yourself? At Kegel8 we know that the strength of your pelvic floor can be a very grey area – especially if you don’t suffer any signs of pelvic floor weakness. But pelvic floor strength is not just about incontinence – it’s about your health. All women should exercise their pelvic floor muscles and that’s why we’ve developed the Kegel8 Squeeze Scale, measured by our first interactive manual pelvic floor exerciser, the Kegel8 Biofeedback Pelvic Trainer. 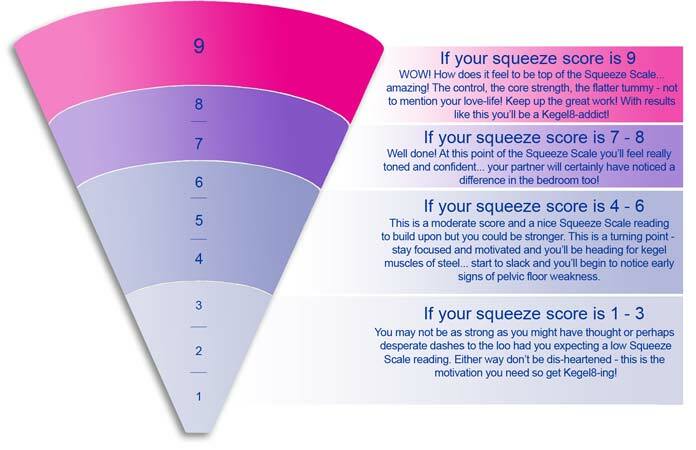 The Squeeze Scale tells you how strong your muscles are, ranging from squeeze score 1 to 9, which means you can improve your strength and not only feel the results but now you can see them too! OK, so you might not feel that great about this but don’t be dis-heartened and always remember, you are not alone! Many women register at these Squeeze Scale levels, especially those who don’t really exercise. Get Kegel8-ing! Use your Kegel8 Biofeedback Pelvic Trainer at least twice per day – morning and night – and stay dedicated. It will pay off as you see your Squeeze Scale climb over the coming weeks. If your muscles are up to it, try and fit a couple of extra lift and squeeze pelvic floor exercises in throughout the day in between using your Trainer – whilst sat at traffic lights or while you brush your teeth. But listen to your body and if you muscles feel too tired then rest them. Tip: When building muscle tone and strength, relaxation is just as important as exercising. This is the average score for those who tend to be aware of their pelvic floor and do actually try and exercise daily, whether by doing manual kegel exercises or by using an electronic pelvic floor exerciser. Average is fine but with the Kegel8 Trainer you and your pelvic floor can be so much more! The inflatable probe gives your muscles a resistance to squeeze against which guides you to target the correct muscles more accurately. Make the most of the interaction the Kegle8 Trainer has to offer – watch your squeeze and lift on the screen for the motivation to squeeze that little bit harder and hold it that little bit longer! Make sure you’re getting those mAs up as high as you comfortably can. Introduce a second exercise session into your day – don’t forget to make sure you allow your muscles sufficient time to rest (8 hours is the recommendation but everyone is different so listen to your body). Experiment with over-all workout and general strengthening programmes if you don’t use them already – you can always alternate them with any treatment programmes you may like to use for incontinence. Tip: Clinical studies show that manual pelvic floor exercises using a form of resistance, such as the Kegel8 Trainer or Kegel8 Vaginal Cones, are more effective than those performed using no resistance. You’ll be pleased with this and rightly so – a Squeeze Scale score like this can only mean one thing… you’ve worked hard with your Kegel8 Trainer and it’s paid off big time! You’ll feel strong, confident, in control, free… and I bet your partner has noticed a difference too! And the best bit is you feel motivated right? You're hooked and you want to reach the top and be a part of that elite Squeeze Scale 9 club. Go for it! Keep up the good work and keep Kegel8-ing! Congratulations, you have kegels of steel! This has taken some dedication and is a result to be proud of, just like reaching that target weight in your diet – wow, what a feeling! Pelvic floor strength of this level is not just about controlling your bladder or getting back to ‘pre-baby’ shape following childbirth – it’s about real core strength too. You’ll feel firmer and stronger from the inside and have probably noticed a visible improvement in any stubborn lower-belly bulge you may have had and love your new flatter tummy. The key now is to keep it up. Much like weight-loss, if you revert back to your old ways your well-earned results will slowly begin to fade. Set yourself a maintenance programme - perhaps exercising 3 times per week and testing your Squeeze Scale once per week to make sure ‘you still got it’! Tip: The pelvic floor is much like any other muscle group in your body – use it or lose it!